By Chris Williams: If you were hoping to see Floyd Mayweather Jr. (44-0, 26 KO’s) face the Filipino Manny Pacquiao for his next fight in September then you can forget it; Mayweather says he has absolutely no interest in fighting Pacquiao now because he’s lost his last two fights, and it’s not interesting to him anymore. The way that Mayweather said it he seems to have closed the book on a fight between him and Pacquiao. Mayweather doesn’t want to fight guys that are struggling and/or over-the-hill, and right now it’s not looking good for Pacquiao with him having lost his last two fights. It’s not just him having lost the fight, it’s the way Pacquiao looked in losing those fights that is pretty tragic. In his loss to Tim Bradley last year, Pacquiao looked like he was only capable of fighting hard for 1 minute of every 3 minute rounds. 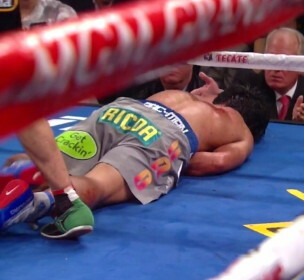 Pacquiao looked like a tired old fighter in need of constant rest breaks to get his wind. I didn’t think Pacquiao would get any worse than that, but sure enough he did in his next bout against Juan Manuel Marquez last December. In that fight, Marquez knocked Pacquiao to the canvas with a looping right hand in the 3rd round, and then three rounds later, Marquez put the Filipino out of his misery with a hard right hand to the head that knocked him clean out. Pacquiao’s promoter Bob Arum has kept him out of the ring ever since and he won’t be back in action until late December against one of Arum’s Top Rank stable fighters – either Brandon Rios or Mike Alvarado. You can expect Pacquiao to get knocked out again and then be faced with some serious questions a about whether he should continue with his sagging career or retire. Getting knocked out by a talented fighter like Marquez is one thing, but to get polished off by the deeply flawed Alvarado or Rios would be pretty much the end for Pacquiao. If he can’t beat those guys then he needs to think hard about retirement.